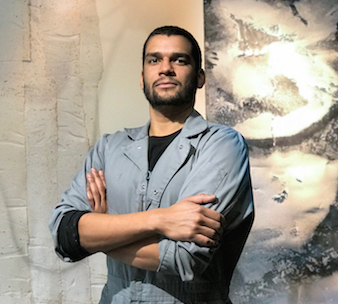 Tahir Karmali opens his studio to demonstrate and explain the techniques of his practice, and leads a workshop in which participants try out the approaches to create their own work of art. This event is free and open to the public with a limited capacity. RSVP is required. Sign up for a reminder. Karmali asks which materials are allowed to become art and how specific materials can expose a story of contemporary identities. In the recent series “PAPER:work,” he used papermaking to examine questions of nationality, authenticity, documentation, and borders; and in the ongoing body of work “STRATA,” he dissects neo-colonial attitudes to raw material extraction in Africa by dismantling discarded cell phone batteries to extract cobalt and lithium for dye-making. Tahir Karmali is a visual artist born and raised in Nairobi, Kenya, and based in Brooklyn, NY. In his work, he is interested in relating narrative to concept, concept to material, and material to process. His practice developed from an interest in contemporary identities as shaped by economic, geopolitical, and social systems. Drawing from contemporary issues surrounding the shifting global economy, Karmali explores narratives and concepts inspired by affected communities. His work combines digital photography, photocopying, collage, textile, sculpture, and papermaking to create objects that unfold these subjects.